In this lesson, we will learn how to identify the conditions for a system of coplanar forces to be equivalent to a couple and find its moment. 𝐴 𝐵 𝐶 𝐷 is a square, where the five forces, measured in newtons, are acting on it as shown in the figure. If the system of forces is equivalent to a couple, determine 𝐹 1 and 𝐹 2 . 𝐴 𝐵 𝐶 𝐷 is a square having a side length of 85 cm. Forces of magnitudes 30, 55, 30, and 55 newtons are acting along the square’s sides, and two equal forces of magnitude 2 5 √ 2 newtons, are acting at 𝐴 and 𝐶 in the directions shown in the figure. Find the couple equivalent to the system. 𝐴 𝐵 𝐶 𝐷 is a square having a side length of 50 cm. Forces of magnitudes 30, 60, 160, and 10 newtons are acting at  𝐴 𝐵 ,  𝐵 𝐶 ,  𝐶 𝐷 , and  𝐷 𝐴 , respectively, while two forces of magnitudes 4 0 √ 2 and 9 0 √ 2 newtons are acting at  𝐴 𝐶 and  𝐷 𝐵 , respectively. If the system is equivalent to a couple, find its moment considering the positive direction is 𝐷 𝐶 𝐵 𝐴 .
𝐴 𝐵 𝐶 is a triangle, where 𝐵 𝐶 = 4 8 c m , and three forces of magnitudes 13, 13, and 24 newtons are acting along  𝐶 𝐴 ,  𝐴 𝐵 , and  𝐵 𝐶 respectively. If the system of forces is equivalent to a couple, determine the magnitude of its moment. In a triangle 𝐴 𝐵 𝐶 , 𝐴 𝐵 = 𝐵 𝐶 = 2 2 c m and 𝑚 ∠ 𝐵 = 1 2 0 ∘ . Forces of magnitudes 2, 2, and 2 √ 3 newtons are acting at  𝐴 𝐵 ,  𝐵 𝐶 , and  𝐶 𝐴 , respectively. If the system is equivalent to a couple, find the magnitude of its moment considering the positive direction is 𝐴 𝐵 𝐶 .
𝐴 𝐵 𝐶 is a triangle, where 𝐴 𝐵 = 8 c m , 𝐵 𝐶 = 3 c m , and 𝑚 ∠ 𝐵 = 6 0 ∘ , and forces of magnitudes 64 N, 24 N, and 56 N are acting along  𝐴 𝐵 ,  𝐵 𝐶 , and  𝐶 𝐴 respectively. If the system of forces is equivalent to a couple, determine the magnitude of its moment. 𝐴 𝐵 𝐶 𝐷 is a square of side length 60 cm, where 𝐸 ∈  𝐶 𝐵 and 𝐹 ∈  𝐶 𝐷 , such that 𝐶 𝐸 = 𝐶 𝐹 = 1 8 0 c m . Forces of magnitudes 75, 5, 40, 40, and 3 5 √ 2 g-wt are acting at  𝐴 𝐵 ,  𝐵 𝐶 ,  𝐶 𝐷 ,  𝐷 𝐴 , and  𝐸 𝐹 , respectively. If the system is equivalent to a couple, find its moment considering the positive direction is 𝐷 𝐶 𝐵 𝐴 .
𝐴 𝐵 𝐶 𝐷 is a rectangle, in which 𝐴 𝐵 = 4 5 c m , 𝐵 𝐶 = 5 5 c m , and 𝐷 𝐸 = 2 8 c m . Forces of magnitudes 225, 275, 265, and 135 newtons act along  𝐴 𝐵 ,  𝐵 𝐶 ,  𝐶 𝐸 , and  𝐸 𝐴 , respectively. If the system of forces is equivalent to a couple, Determine the magnitude of the moment of the forces. 𝐴 𝐵 𝐶 𝐷 is a rectangle in which 𝐴 𝐵 = 1 2 c m , 𝐵 𝐶 = 6 c m and 𝑂 is midpoint of 𝐴 𝐵 . Forces of magnitudes 7 N, 2 N, 6 N, 18 N, 3 √ 5 N, and 1 0 √ 2 N are acting along  𝐶 𝐵 ,  𝐴 𝐵 ,  𝐷 𝐴 ,  𝐶 𝐷 ,  𝐴 𝐶 , and  𝑂 𝐶 respectively. If this system of forces is equivalent to a couple, find the norm of its moment. In a trapezium 𝐴 𝐵 𝐶 𝐷 , 𝑚 ∠ 𝐴 = 𝑚 ∠ 𝐵 = 9 0 ∘ , 𝐴 𝐷 = 2 7 c m , 𝐴 𝐵 = 3 5 c m , and 𝐵 𝐶 = 3 9 c m . Given that forces of magnitudes 54, 70, 78, and 74 newtons are acting along  𝐷 𝐴 ,  𝐴 𝐵 ,  𝐵 𝐶 , and  𝐶 𝐷 respectively. If the system of forces is equivalent to a couple, find the magnitude of the moment of the forces. is a regular pentagon whose side length is 16 cm. Five forces, each of magnitude 11 N, are acting at , , , , and , respectively. If the system is equivalent to a couple, find the magnitude of its moment, considering the positive direction is , rounded to two decimal places, if needed. 𝐸 𝐴 𝐵 𝐶 𝐷 is a pentagon in which 𝑚 ∠ 𝐸 = 𝑚 ∠ 𝐵 = 𝑚 ∠ 𝐶 = 9 0 ∘ , 𝐸 𝐴 = 2 4 c m , 𝐴 𝐵 = 𝐶 𝐷 = 1 9 c m , and 𝐵 𝐶 = 2 6 c m . Forces of magnitudes 72 N, 57 N, 78 N, 57 N, and 30 N are acting along  𝐸 𝐴 ,  𝐴 𝐵 ,  𝐵 𝐶 ,  𝐶 𝐷 , and  𝐷 𝐸 respectively. If this system is equivalent to a couple, find its moment norm. 𝐴 𝐵 𝐶 𝐷 𝐸 𝑂 is a regular hexagon of side length 8 cm, and forces of magnitudes 2, 13, and 11 newtons are acting at  𝐴 𝐵 ,  𝐶 𝑂 , and  𝐸 𝐷 respectively. If the system is equivalent to a couple, determine the magnitude of the moment of the forces. 𝐴 𝐵 𝐶 𝐷 𝐻 𝑂 is a regular hexagon whose side length is 7 cm. Forces of magnitudes of 9, 8, 10, 9, 8, and 10 newtons are acting along  𝐵 𝐴 ,  𝐴 𝑂 ,  𝐻 𝑂 ,  𝐻 𝐷 ,  𝐷 𝐶 , and  𝐵 𝐶 respectively. Find the magnitude of the moment of the couple that is equivalent to the system. If 𝐴 𝐵 𝐶 𝐷 𝐸 𝑂 is a regular hexagon having a side length of 6 cm, where forces of magnitudes 20 N, 20 N, 13 N, 13 N, and 2 0 √ 3 newtons are acting along  𝐴 𝐵 ,  𝐵 𝐶 ,  𝐶 𝑂 ,  𝐸 𝐷 , and  𝐶 𝐴 , respectively, and the system is equivalent to a couple, find its moment norm. 𝐴 𝐵 𝐶 𝐷 is a trapezium, where 𝑚 ∠ 𝐴 = 𝑚 ∠ 𝐵 = 9 0 ∘ , 𝐴 𝐵 = 2 4 c m , 𝐴 𝐷 = 1 1 c m and 𝐵 𝐶 = 1 8 c m . 𝐸 and 𝑂 are the midpoints of 𝐴 𝐵 and 𝐵 𝐶 respectively. Forces of magnitude 77 N, 175 N, 220 N, and 10 N are acting along  𝐴 𝐷 ,  𝐷 𝐶 ,  𝐶 𝐴 , and  𝐸 𝑂 , respectively. If the system of forces is equivalent to a couple, determine the magnitude of the moment of the forces. 𝐴 𝐵 𝐶 𝐷 is a quadrilateral in which 𝐴 𝐵 = 𝐴 𝐷 = 8 c m , 𝐵 𝐶 = 𝐶 𝐷 = 1 3 c m , and 𝑚 ∠ 𝐵 𝐴 𝐷 = 1 2 0 ∘ . Forces act on the directed line segments  𝐴 𝐵 ,  𝐵 𝐶 ,  𝐶 𝐷 , and  𝐷 𝐴 . If the system is reduced to a couple having a moment of 4 2 √ 3 N⋅cm in the direction of 𝐴 𝐵 𝐶 𝐷 , find the magnitude of 𝐹  and 𝐹  . 𝐴 𝐵 𝐶 𝐷 is a trapezium in which 𝐴 𝐷 ∥ 𝐵 𝐶 , 𝐴 𝐵 is perpendicular to them, 𝐸 is the projection of 𝐷 on 𝐵 𝐶 , 𝐵 𝐶 = 1 6 c m , 𝐴 𝐵 = 1 2 c m , and 𝐴 𝐷 = 1 1 c m . Forces of magnitudes 5 1 1 4 1 3 4 1 0 1 0 , , , , a n d newtons are acting along  𝐶 𝐴 ,  𝐴 𝐷 ,  𝐷 𝐶 ,  𝐸 𝐷 , and  𝐴 𝐵 respectively. If the system is equivalent to a couple, find the magnitude of the couple moment. 𝐴 𝐵 𝐶 𝐷 is an isosceles trapezium in which 𝐴 𝐷 ∥ 𝐵 𝐶 , 𝐴 𝐷 = 1 5 c m , 𝐴 𝐵 = 𝐷 𝐶 = 1 7 c m , and 𝐵 𝐶 = 3 1 c m . Forces having magnitudes of 51, 79, 51, and 31 newtons are acting in the directions of  𝐴 𝐵 ,  𝐵 𝐶 ,  𝐶 𝐷 , and  𝐷 𝐴 , respectively. If the system is equivalent to a couple, find the magnitude of its moment considering the positive direction is 𝐷 𝐶 𝐵 𝐴 .
𝐴 𝐵 𝐶 𝐷 is a rectangle, where 𝐴 𝐵 = 𝑥 cm, 𝐵 𝐶 = 2 𝑥 cm, and 𝐸 and 𝑂 are the midpoints of 𝐴 𝐷 and 𝐵 𝐶 , respectively. Forces of magnitudes 8 N, 8 N, 3 1 √ 2 N, and 2 3 √ 2 N are acting along  𝐸 𝐴 ,  𝐴 𝐵 ,  𝐵 𝐸 , and  𝐷 𝑂 , respectively. Given that this system of forces is equivalent to a couple, determine the magnitude of its moment in terms of 𝑥 , giving your answer in N ⋅ cm. The sides of an equilateral triangle 𝐴 𝐵 𝐶 , taken the same way round, completely represent three forces with a drawing scale of 4 cm to 8 N. If the length of a side of the triangle is 24 cm, find the magnitude of the resulting couple, giving an exact answer in N⋅cm. 𝐴 𝐵 is a rod having a length of 105 cm and negligible weight. Forces of magnitudes 214 N, 67 N, 115 N, and 176 N are acting on the rod as shown in the figure. Given that 𝐶 and 𝐷 are the points of trisection of 𝐴 𝐵 , determine the algebraic sum of the moments of these forces about the point 𝐴 . Three forces  𝐴 𝐵 ,  𝐵 𝐶 and  𝐶 𝐴 are represented by the sides of a right-angled triangle 𝐴 𝐵 𝐶 where 𝐵 is a right-angle. 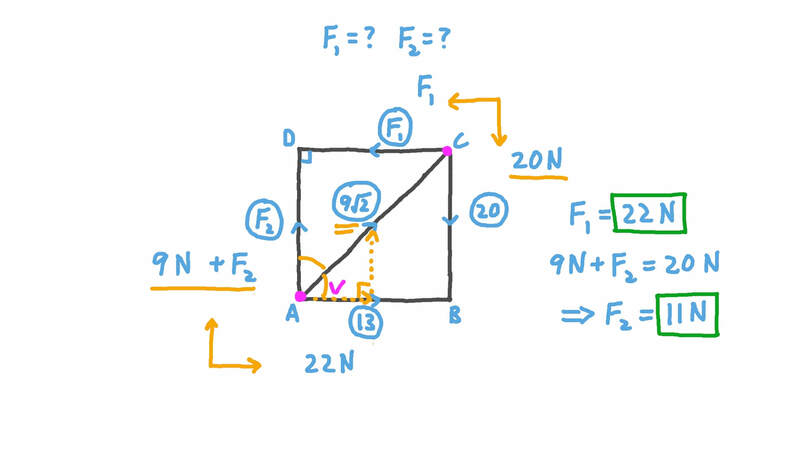 1 cm on the triangle represents 40 N of force, and 𝐴 𝐵 = 1 9 c m and 𝐵 𝐶 = 4 0 c m . Find the magnitude of the resulting couple. 𝐴 𝐵 𝐶 𝐷 is a quadrilateral, where 𝐴 𝐵 = 1 8 c m , 𝐵 𝐶 = 2 4 c m , 𝐶 𝐷 = 𝐷 𝐴 = 1 7 c m , and 𝑚 ∠ 𝐴 𝐵 𝐶 = 9 0 ∘ . Given that four forces, measured in newtons, are acting on the quadrilateral as shown in the given figure, determine the magnitude of the moment of the equivalent couple. Three forces of magnitudes 15, 10, and 15 newtons are acting along  𝐴 𝐵 ,  𝐵 𝐶 , and  𝐶 𝐴 respectively. Given that 𝐴 𝐵 = 𝐴 𝐶 = 3 6 c m and 𝐵 𝐶 = 2 4 c m , determine the magnitude of the resultant couple rounded to the nearest hundredth.